The business corporation registry of the South Carolina Secretary of State is engaged with keeping well maintained records of any Corporations, Limited Liability Companies, Limited Partnerships, Limited Companies and Limited Partnership those are registered with the same. The registry has filing details of every corporate entity that are or were incorporated in the US state of South Carolina. If you are into finding details of any business entity headquartered in South Carolina and registered with the Secretary of State of South Carolina, then you have arrived at the right place. 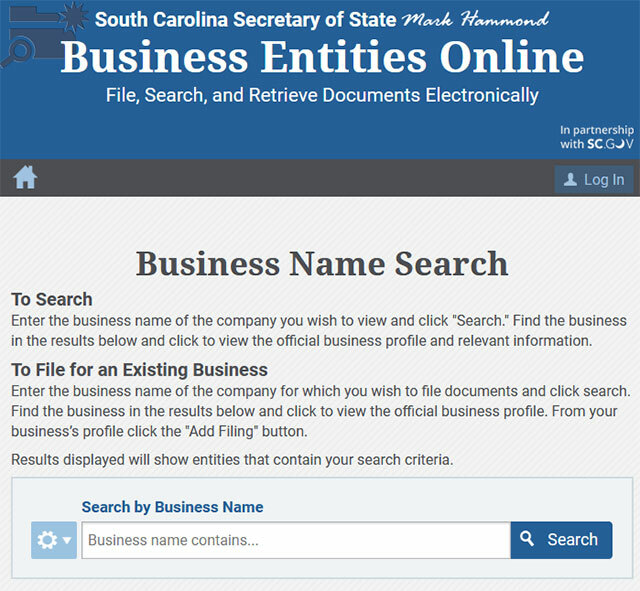 To search for a registered entity in the South Carolina SOS database, you need to know either the corporate name or the registered identity. 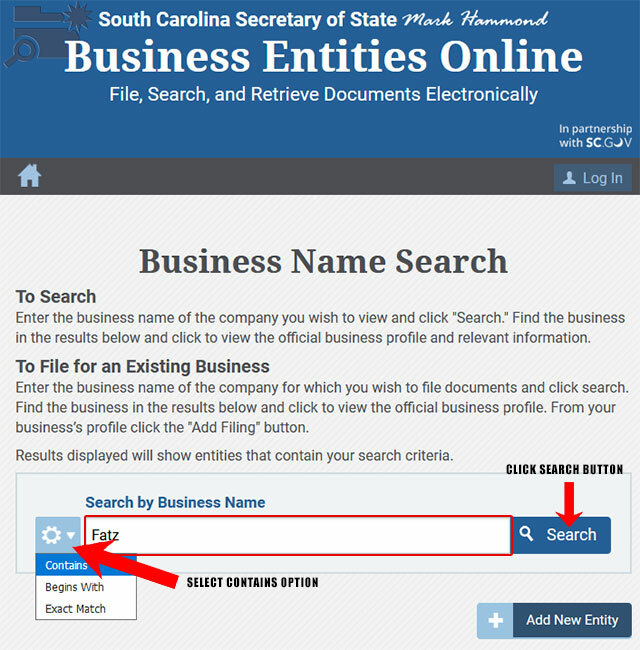 Below is a step by step guidelines on how to use the South Carolina business search tool. 1. The first step is to access the South Carolina business search page by clicking here. The page looks similar to the screenshot below. 2. The business search form allows you to search by business name. They also allow you to select additional options to widen or narrow your search. If you click the cog icon next to the text field, it will give you the option to search by names that contains, begins with or exact match. For this example we will use the default option "Contains". 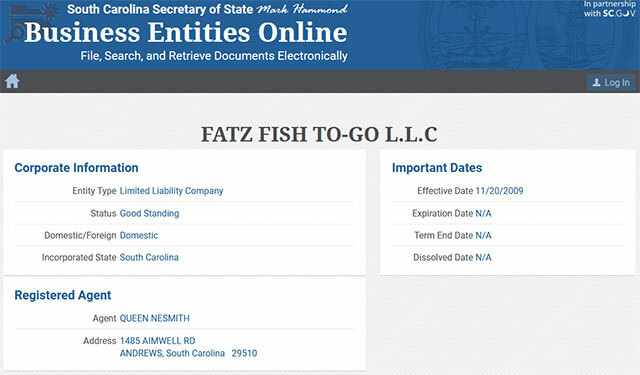 Also go ahead and type "Fatz" in the "Search by Business Name" text field and then click the "Search" button as shown in the screenshot below. 3. Once you click the "Search" button, they will display a list of results that match your search criteria. They will show the entity name, date of incorporation, entity type, status and state for each business listed. To view the details for a business entity, click the entities name as shown in the screenshot below. 4. When you click a business entities name, you will then be taking to a page that show the details for that business. This includes the entity name, type, status, agent, important dates, official documents etc. as shown in the screenshot below. 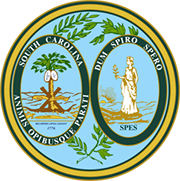 The office of the Secretary of State of South Carolina is an elected constitutional office which is responsible for serving many areas of the state. The current Secretary of State of South Carolina is Mark Hammond who has been serving the office since 2003. The Secretary of State of South Carolina is responsible for a wide set of duties. He is in charge of maintaining a clear record of the corporations based in South Carolina and is also authorized to issue cable franchise applications and certifications, issue annexure for lands, administer trademarks and trade names. Generally the duties of the Secretary of State of South Carolina are divided among the following five divisions of the state.